Do Bunions Need Surgical Treatment? Hallux valgus, often referred to as "a bunion," is a deformity of the big toe. The toe tilts over towards the smaller toes and a bony lump appears on the inside of the foot. (A bony lump on the top of the big toe joint is usually due to a different condition, called hallux rigidus.) Sometimes a soft fluid swelling develops over the bony lump. The bony lump is the end of the "knuckle-bone" of the big toe (the first metatarsal bone) which becomes exposed as the toe tilts out of place. Bunions develop when the pressures of bearing and shifting your weight fall unevenly on the joints and tendons in your feet. This imbalance in pressure makes your big toe joint unstable, eventually molding the parts of the joint into a hard knob that juts out beyond the normal shape of your foot. Experts disagree on whether tight, high-heeled or too-narrow shoes cause bunions or whether footwear simply contributes to bunion development. Other causes include inherited foot type, foot injuries, deformities present at birth (congenital). Bunions may be associated with certain types of arthritis, particularly inflammatory types, such as rheumatoid arthritis. An occupation that puts extra stress on your feet or one that requires you to wear pointed shoes also can be a cause. It is unusual to have much bunion or hallux valgus pain when out of shoe wear or at rest. There are exceptions to this and in particular if symptoms have been ignored during the day and the bunion has become very painful during the day then some symptoms may be present at night. The pain from the region of the great toe at rest or at night is however more often a symptom of an arthritic big toe (hallux rigidus) rather than a straightforward bunion. To confuse matters these two conditions can sometimes coexist. Bunion or hallux valgus pain is most often present when walking in enclosed shoes. There may be little bunion pain in sandals or barefoot. It is unusual to have much bunion pain when not putting weight on the foot or at night. If there is bunion pain at rest or at night then there may also be arthritic change within the toe. When an x-ray of a bunion is taken, there is usually angulation between the first metatarsal bone and the bones of the big toe. There may also be angulation between the first and second metatarsal bones. These angular irregularities are the essence of most bunions. In general, surgery for bunions aims to correct such angular deformities. 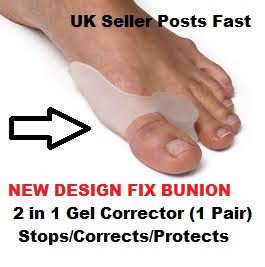 Surgery is the only way to correct a bunion. A bunion will usually get worse over time, so if it's left untreated it's likely to get bigger and become more painful. If your bunion is causing a significant amount of pain and affecting your quality of life, your GP may refer you to be assessed for bunion surgery. The aim of surgery is to relieve pain and improve the alignment of your big toe. Surgery isn't usually carried out for cosmetic reasons alone. Even after surgery, there may still be limits to the styles of shoe you can wear. Bunion surgery is often carried out as a day procedure, which means you won't have to stay in hospital overnight. The procedure will either be carried out under a local anaesthetic or a general anaesthetic. To help prevent bunions be sure your shoes don't cramp or irritate your toes. Choose shoes with a wide toe box - there should be space between the tip of your longest toe and the end of the shoe. Your shoes should conform to the shape of your feet without squeezing or pressing any part of your foot. Avoid pointy-toed shoes. Why Is There A Leg Length Discrepancy After Hip Replacement? laurindaangle is using Hatena Blog. Would you like to try it too?